A lot of us think that Tweeting is one of the most spontaneous and intuitive social media activities in which we engage. But, if we choose to be so engaged, Tweeting can also be more of a science. This article is really helpful for people to manage the social media sites. Especially for those companies’ twitter, there is a principle saying that you should interact with followers personally, rather than officially. For many companies ,they often make this mistake. Actually ,it reveals a psychology that people like being treated like a person when they say something in the social media sites. I personally do not use twitter. In the early days of twitter I felt it was too complicated and had no idea how to use it. However after reading this post I feel like twitter could be a great social networking site that includes some type of fun and with this post I can finally use twitter the right way. Twitter has grown into one of the biggest and most popular social media sites. It seems simple, but it was interesting to find how much data and information goes into the “art of tweeting.” I never thought about how specific a profile could be or some aspects on the site that I was not even aware of. Now, the next time I use twitter I will be much more conscious of everything the site contains and the science behind it. I’ve had Twitter for years, but never really used it too much. I didn’t understand the purpose of tweeting. In this day and age, Twitter and Instagram are two of the biggest social media sites used worldwide for personal use and for company use. I never thought about analyzing Twitter and discovering the art of creating the “best ad post”. A lot of analyzing and thought goes into the right hashtags and the perfect picture in order to draw a client in and be requested for a follow. I’m curious to see what other new things come out within the next couple of years. I have a twitter. I think that it has honestly become really pathetic. It is simply just turned into people complaining about their life and trying to make funny comments. The only thing that is actually important is when that I follow hofstra on twitter and it gives me updates about things happening in school, otherwise it is basically useless. Twitter is a very important resource for companies, especially ones that aim to connect with the generation that we are a part of. I think the way a company uses its twitter determines whether or not people will follow it. I agree with the point about balancing content from your own brand with content from other places. This keeps a company’s twitter not only interesting, but stops it from becoming one big advertisement. Non-business users, use all of these tactics. However, it is interesting to see them broken down in such a way that aids the growth of a business depending on what your goal is. I feel that almost all of these tips can be used on any social media platform not just twitter. Social media is so prominent in today’s culture that this would be a great place for new business to start getting themselves out there. It is very correct that we didn’t pay much attention to how scientifically use Tweeter to build brand when we tweeted on it. Blindly tweeting will actually annoying your followers and maybe lose them. For example when the company tweets so many advertisements about promotions of products, followers will feel that they are too boring because those information is not what they really want and need. Therefore, it is very necessary and useful for e-marketers to know those sciences which are good for increasing engagement and interaction with target consumers. I think that it is partly due to my science major background, but I do not find twitter to be all that informative in regards to business. I follow very few companies, my twitter is private, and I don’t particularly care for hashtags. However, I did find the statistical information provided interesting as I seemed to contradict most of it. I do not like long hashtags and I absolutely will not reply to a direct message on twitter. But for those who are more involved in the communications aspect of business, this science is rather fascinating. This article is really useful to companies trying to connect with the more tech savvy generation. Companies need to put careful consideration into their tweets to catch the eye of many people. If they can get people to stop and read, and retweet the tweet then the company will be able to get their word across more people and more places. If companies don’t take tweeting seriously, they can end up getting bad publicity from it. Oreo during the half time black out was able to tweet to make use of the inconvenience by #youcanstilldunkinthedark but if you were responding to #whyshestayed by saying she stayed for the pizza, it caused bad publicity. Companies need to under popular hashtags and use twitter in a creative way. As somebody who grew up in this technological revolution, I found this article to be funny but actually helpful. In today’s world where many people might see your Twitter page before they even see you, it is important to make sure you are branding yourself in the light you want to be seen in. From a business perspective, I think this chart is actually very helpful since it seems as though retailers are getting involved in social media, but not necessarily in the right way; when tweeting to users who are fully-engaged in the Twitter trends and what is acceptable online, many companies who tweet appear outdated or out-of-the-loop, which immediately turns off a consumer. I know that Twitter is very popular and useful for lots of people. However, I do not use Twitter in my daily except I have some questions to ask for companies’ representatives. The design of Twitter is not that appealing to me and sometimes I just get confused about how to use it. Comparing to Facebook and Instagram, I prefer the latter two social media, which are more attractive to me and easy to use. As a religious user of both social media and twitter, I find it very interesting that there is a proposed science behind twitter. I use Twitter just as a way to expression my emotions at the time or share my interests with my followers. 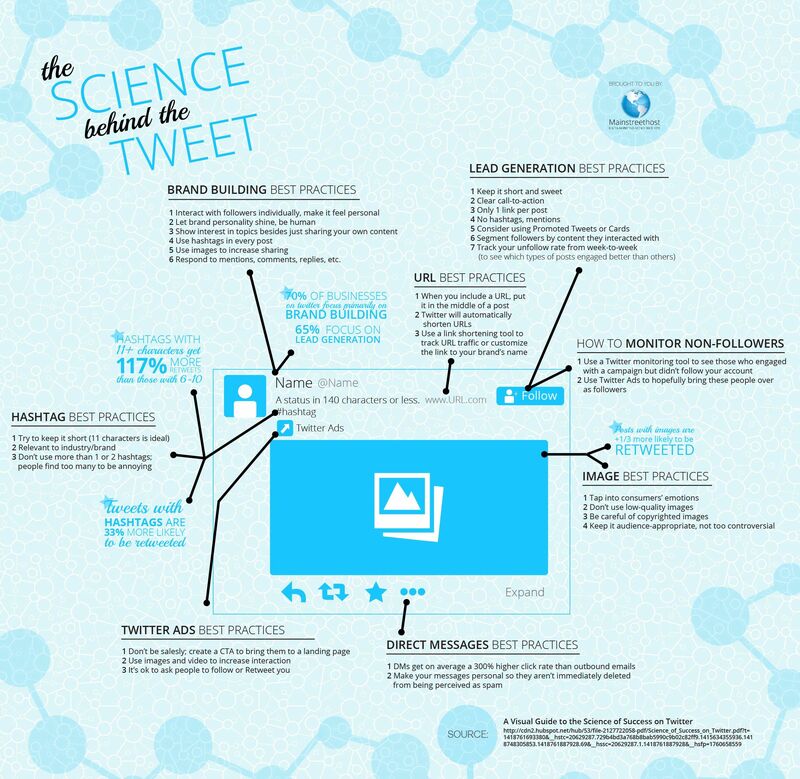 I never really thought of it as a science though direct messaging, images, URL’s, brands, and hashtags. However, I am only a college student and not working for a global company. Its amazing how companies can use twitter as ways to see peoples interests as well as market themselves worldwide. From here on out the “act of tweeting” may never be the same. there is no doubt that the Twitter is a very important marketing tool for the company. twitter provides a platform allows company more understand customers, on the order hand, people can more easier to interactive with some company and famous people via twitter. but how to use the Twitter well is not easy for the company, because they have to consider their corporate image and the emotion of their followers. I do not like twitter and I am not interested in having an account. I don’t like its set up and I find it complicated to use. You can get lost in translation, I think Facebook is a better tool. By visualizing your tweets, you can gather more likes and retweets. Because images are easily to catch readers’ attention than words. In addition, Twitter is known as short message but convey useful and interesting information. Moreover, hashtags with more than 11 characters are more attractive, since it indicates this hashtag is a hot topic and more people would like to find out the reasons. After read this, I think not only Tweet has this function, but also Facebook or other social media have this function. How to post efficiently? How to use these icon? That is very important.For example, we do not know how to monitor non-followers. First we could use a twitter monitoring tool to know who didn’t follow your account and then use twitter ads to hopefully bring these people to be followers. That is very interesting. After we do like it said, it will improve us to use Twitter more accurate and find it more easier than Facebook. According to the advices, I feel it is reasonable. Social media, as a matter of fact, should be the extension of real life social life, it also provides a great opportunity for companies to communicate with their fans and customers. Even though people might have enough social life in real life, but people are still pursing the feeling of human-like behavior from the company’s accounts on social media. People always feels better when the communication looks like private or personalized. So I think the next thing of social media marketing can be the programming of direct message. How to make the direct message more likely to be perceived as a information that is sent by someone of the company to you can increase the traffic from direct messaging greatly. Twitter is a great marketing tool for a company, and it provides a place that allows companies to get great customer feedback. People can interact with companies and famous people on twitter by following their tweets. However, with all of the ongoing tweets on the newsfeed you can get lost trying to keep in contact because of all the mentions depending on your following and followers tweets. I like facebook and instagram much better! Who knew there was actual science behind the perfect hashtag? Next time you’re trying to come up with something catchy keep in mind that tweets with hashtags containing 11 or more characters get on average 117% more Retweets than those with 6 to 10. Also tweets from businesses with one hashtag are 69% more likely to get retweets than those with two hashtags. Also make sure to search twitter and see if the hashtag is already being used. It could be a sensitive topic with an already negative connotation.